First, an update regarding the couple injured in last night’s terror attack: The baby, delivered by emergency C-section last night, is in critical condition and his life is in immediate danger. Please pray for the “Rach HaNolad ben Shira Yael” (רך הנולד בן שירה יעל). Shira Ish-Ran (Shira Yael bat Liora Sara) remains in the ICU in serious but now, b”H, stable condition. And the husband, Amichai Ish-Ran (Amichai Yishai ben Galila) is in good condition and is recovering from bullet wounds to his leg. Shira’s father, Chaim Silberstein: “Our daughter, Shira, is hospitalized in the ICU and her condition is stable. But many prayers are still needed. The baby’s also not in such great condition and needs many prayers [CJW: the baby is in critical condition and his life is in immediate danger. Please pray for “Rach HaNolad ben Shira Yael”]. We just want to express our gratitude to the medical staff of Shaarei Tsedek who have given medical care that is above and beyond to our daughter, as well as to our son-in-law, Amichai, who was hit by 3 bullets in his leg, and was lightly injured. Shira’s mother, Liora Silberstein: “I just want to agree with what my husband said, that the staff here, the nurses, the social workers, the doctors are above and beyond. And we are very, very grateful to them and to everyone who is praying now. 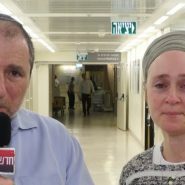 Chaim Silberstein: “Our daughter was hit by a bullet in her lower abdomen, and apparently, miraculously, the bullet exited without causing irreparable damage through her pelvis, without breaking it, and her life was saved by the medical staff. “She lost a tremendous amount of blood, and received 12 blood transfusions. And her life was, quite simply, saved here by the medical staff. We are continuing to pray that her condition will continue to stabilize and improve. And, of course, we will be remaining at the hospital, and we are continuing to hope and pray. Chaim Silberstein: “Shira is 21 years old, she has a twin brother and both of them got married just a month apart, 9 months ago. Shira and her husband live in Elon Moreh, her husband studies in the hesder yeshiva there, he served in the IDF in Golani, and Shira is studying towards her BA at Michlelet Orot. From Canada…..we will pray to the Lord for your family. Our God is a mighty God!